I first came across Karen Salmansohn, a year ago in my FaceBook feed. I was curious about her tag on her website, “Self Help for People Who Wouldn’t Be Caught Dead Doing Self-Help”. The line was catchy, and I liked how she played with the area of self-help, that seemed to become increasingly popular. People were starting to become more self-aware, wanting to understand “why are they here” and “what is there purpose”. As the case when something seems to be on trend, you get different people popping out of the woodwork, giving their two cents! I also like people who do not sound too “cliche”. As I navigated around her website, I also found out that she had been endorsed by Oprah Winfrey, which is always a good sign. 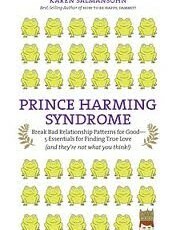 I paid attention to a book that she wrote on dating, called: Prince Harming Syndrome. I loved two things here: 1) The play with words and 2) It was about breaking bad relationship patterns. This was different to how to the love acquisition styled books, which shouted how to get the one. As mentioned by Karen, this will not make a lasting happy ever after style relationship. I liked how Karen started the book with giving an account of her old relationship pattern, with the Prince Harming type, to where she is today with her husband and son Ari. From reading the book, I learnt where she got the inspiration for naming her son. There are three types of categories of relationships described in the book. Two out of the three, you do not want to fall into if you really want to have a sustaining relationship. In the book, Karen looks not only at the outward view of looking for love but also about your internal workings. So often, people are going looking for things when they do not truly know the person inside. Like with the philosophy of letting things in: sometimes you need to let go of the negative baggage, which is not really serving your purpose. This can mean past relationships, and even the stories that you may have learnt from your parents. So it is therefore an inside story. Be kind. Being kind is about loving you, as well as being loving to others. In a relationship as Karen states, you need to be a good listener and show appreciation. Often when we think we have something, we may start to take it for granted. People want to feel special. Shakespeare, who has to be one of my all time favourite writers, once said that if you act in haste, then you will repent in leisure. Too often in the dating game, people like to jump in and forget to ask those questions that are important to them. And you can see this when you read articles where people complain about being in a relationship, where their partner does not want to commit. As Karen suggests, the early stages of a relationship is getting to know the person. Find out what their views are on commitment, what is important to them, and I do not want to ruin the surprise for you so read the book to find out the rest!